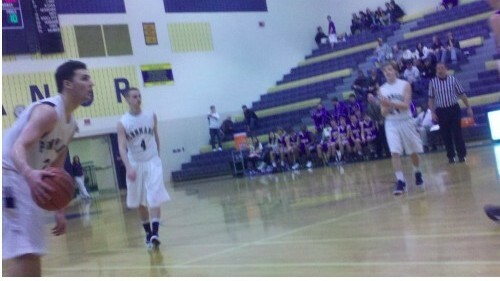 Penn Manor’ basketball team couldn’t be stopped after the first quarter with multiple unanswered points. The Ephrata Mountaineers came out strong in the first quarter looking for their first win of the season. Leading the Comets 17-12, several points were put up by Ephrata senior Jeremy Franck totaling 12 by the end of regulation. The Comets would not stay quiet for long going on a streak of points with the help of senior Marc Summy who scored 26 points total for the night. Marc Summy was a large offensive contribution to the Comets in the second half scoring a total of 26 points. Penn Manor took the lead into half time with the score at 30-25. “We tried some new things which caused us to have a slow start but offensively helped us spread the court out better so our offense didn’t have as much difficulty scoring as in past games,” said Summy. It was all Comets from that point on. Ephrata kept the score close, but was not able to take back the lead in the second half. Points from junior Brady Charles, senior Jay Jackson, senior David Burch, senior Landon Alexich, junior Alex Quinn, and senior Reagen Forrey helped Penn Manor to get their second win of the season. Ephrata senior Brian Neff was the only one to foul out in the game. Summy has averaged 20 points a game for the Comets and continues to be a contributing factor. Penn Manor junior Brady Charles said “[the game was] as ugly as a W can be,” via Facebook referring to their win over Ephrata. Whether the win was ugly or not, the Comets got a much needed win to save a poor start to the season.